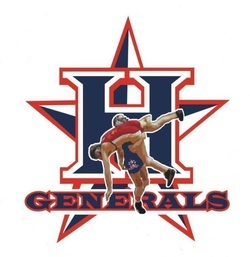 Heritage senior Ryan Craft led the Generals at the State Traditional Tournament in Macon on Feb. 13-16th wrestling in the Finals of the AAAA State Championship at 113 lbs! Ryan is now a 3X State Medalist and 2X State Runner-Up. After wrestling a great match Ryan Craft medaled 2nd at 113 lbs. Ryan tied the School Record for most Wins in a Season with 65 wins and he set a new School Record for Most Career Wins with 204 Career Wins. Garett Stephen medaled 4th at 152 lbs. Seth Ingle medaled 5th at 160 lbs. Alex Eacret medaled 6th at 195 lbs. Jeffery Curtis finished 7th at 220 lbs and Drake Parker was a State Qualifer at 182 lbs. All six Generals that qualified for State wrestled well! The Congratulations to the new Takedown Club Officers for 2018-2019. Thanks to the retiring officers for your service! Buy a Chick fil a' biscuit on Friday AM ($3.25). The Heritage Wrestling Team finished in 9th place out of the 55 teams represented at the STATE Traditional Wrestling Tournament on Feb. 22nd. Senior Tyler Hill medaled 2nd at weight class 138 and Freshman Chuckie Thurman medaled 2nd at weight class 113. Senior Austin Frye and Junior Blaine Bird qualified for state and wrestled well but did not medal (Frye was 1 round from medaling and Bird was 2 rounds from medaling). Congratulations on a great year! 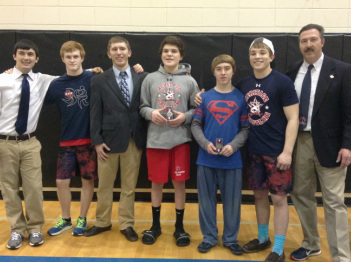 The Heritage Wresting Team ended the season with a strong finish. The Generals placed 6th out of 55 teams at the Georgia AAAA Traditional State Tournament and had 4 medalists. Individual medalists are Jacob Stephens 6th, Tyler Hill 5th, Isaiah Knight and Michael Moore are both State Finalists and both placed 2nd. The Generals Wrestling Team placed higher at the State Tournament than any other area team except Gilmer who are the State Champions. The team also had a final dual meet record of 21-14. The wrestlers and coaches want to thank the administration and fans for their support in making this a successful season. Heritage Wrestling competed in the AAA State Traditional Wrestling tournament in Atlanta and finished ahead of defending State Champions Gilmer by a score of 139 to 128. Heritage Wrestling earned it's first State Championship and the first boys State Championship in school history. 126- Madison Martin 2nd, 132- Landon Reed 1st, 145- Logan Perkins 2nd, 170- Andy Bratton 2nd, 182- Jacob Tripp 3rd, 195- Michael Moore 2nd. Also, during the tournament Landon Reed earned his 200th Career Win and became Heritage's 1st 2X State Champion. Click on the Match Results page for more results. The Generals placed 3rd out of 40 teams at the brutally tough Militia Duals in summer 2011!